India’s Independence Day, and everybody home. I was all in a mood to enjoy the day, cooking, eating and of course having fun. I started preparing for a nice and heavy lunch for the day. The menu today consisted of a lot many items, to celebrate the 61st year of our independence. So, the first thing that came to mind of was definitely any chicken preparation. Chicken had always been the way of celebrating, and today was no exception at all. Sending it to Curry Mela hosted by Srivalli. Slice one onion into four halves. In a deep pan take 3 or 4 cloves of garlic, julienne ginger, the onion, 2 tomatoes along with the chicken and cover it with water. Boil the chicken till it is tender. Julienne the rest of the onions. Heat oil in a wok. Add onion, garlic cloves, ginger-garlic paste and gota garam masal. Sauté till the onions become brown. Add turmeric powder, chili powder, the boiled tomatoes and salt. Fry for a minute and drop in the boiled chicken to the fry spices. Mix the spices with the chicken well and then add the chicken stock already made. Cook till the gravy thickens and serve with rice, roti or paratha. Enjoy the Chicken-do-peyaja. Catch you soon, till then happy cooking and happy eating. 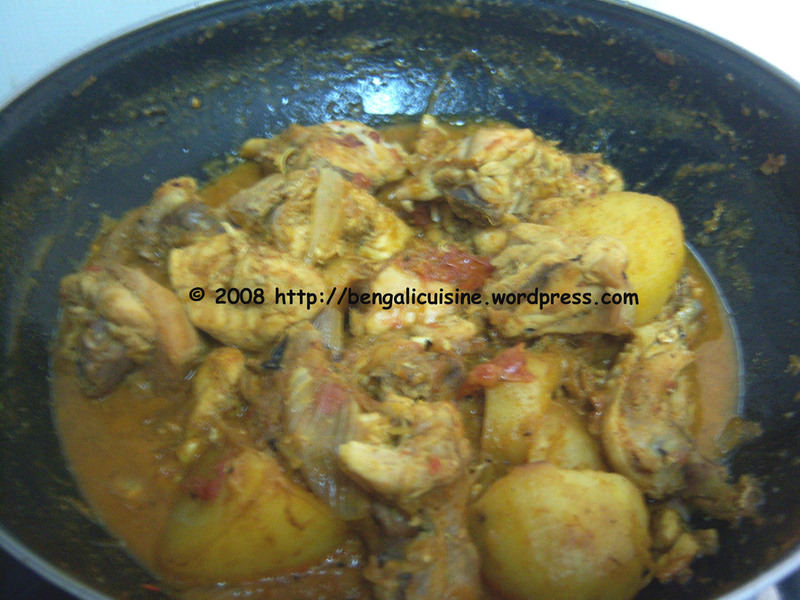 Sending this to Theme for the Month of September – Chicken on Srivalli‘s blog.